Inspired by the rustic charm of New York Brownstone houses in the contemporary context, where a complete atmosphere for lifestyle living, play and recreation comes together. Architecture language with its straight lines and rustic expression is immediately standout among the matured neighbourhood. Other than URA’s Master Plans for the Northern vicinity of Singapore, here’s also outlining the developments for Canberra. i) Future Canberra MRT (less than 200m from The Brownstone EC, is stipulated to be ready by 2019, is located between Sembawang & Yishun MRT stations), daily conveniences and sports & recreation development are all within easy reach. 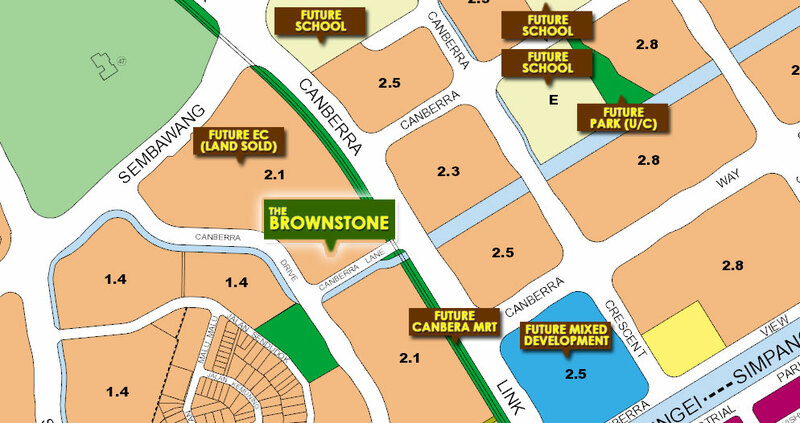 ii) Future 3-storey neighbourhood centre next to Canberra MRT comprising shops, a supermarket, a food court, enrichment centres, as well as a childcare centre and education centre. 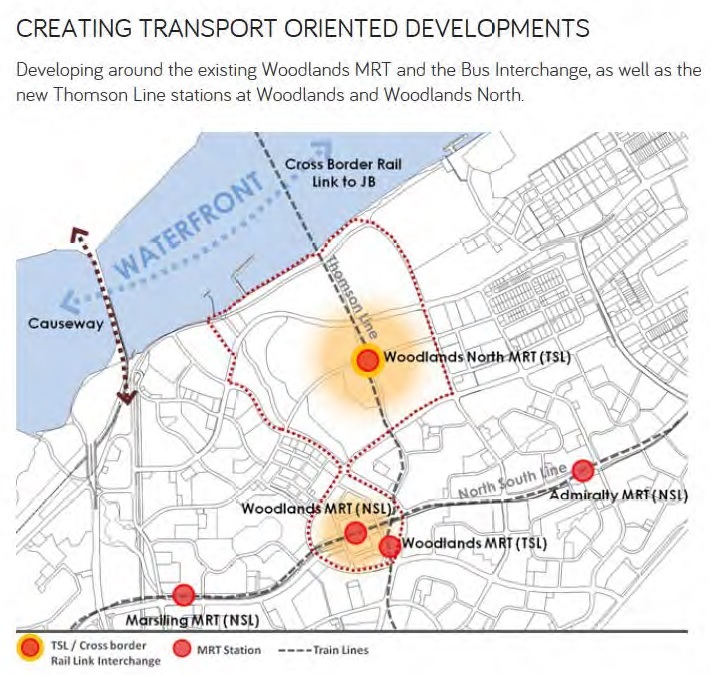 iv) 3 MRT stopsstops to Woodlands MRT stationwhich will serve as an interchange, allowing travelers to take the proposed Rapid Transit System Link between Singapore and Johor Bahru. 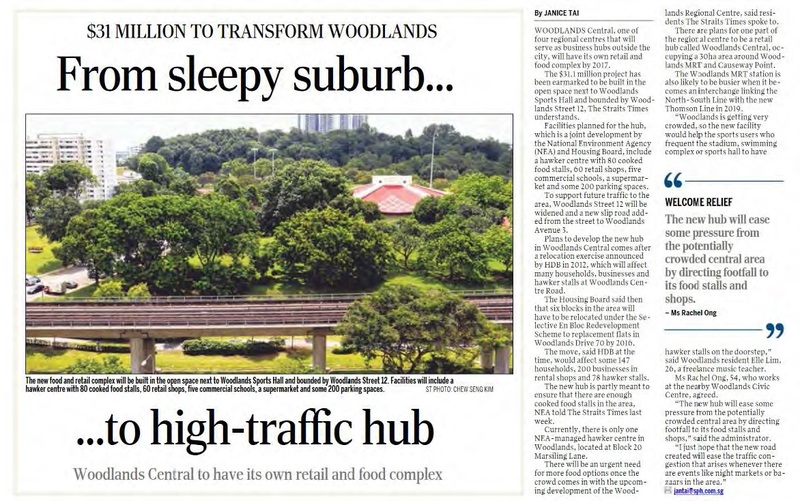 v) URA’s S$31 million project to transform Woodlands Central from a sleepy neighbourhood suburb into 1 of the 4 Business Hubs outside of the city, set to finish in 2017, will feature a supermarket, a hawker centre with 80 cooked food stalls, 5 commercial schools, 60 retail shops & approximately 200 parking spaces. 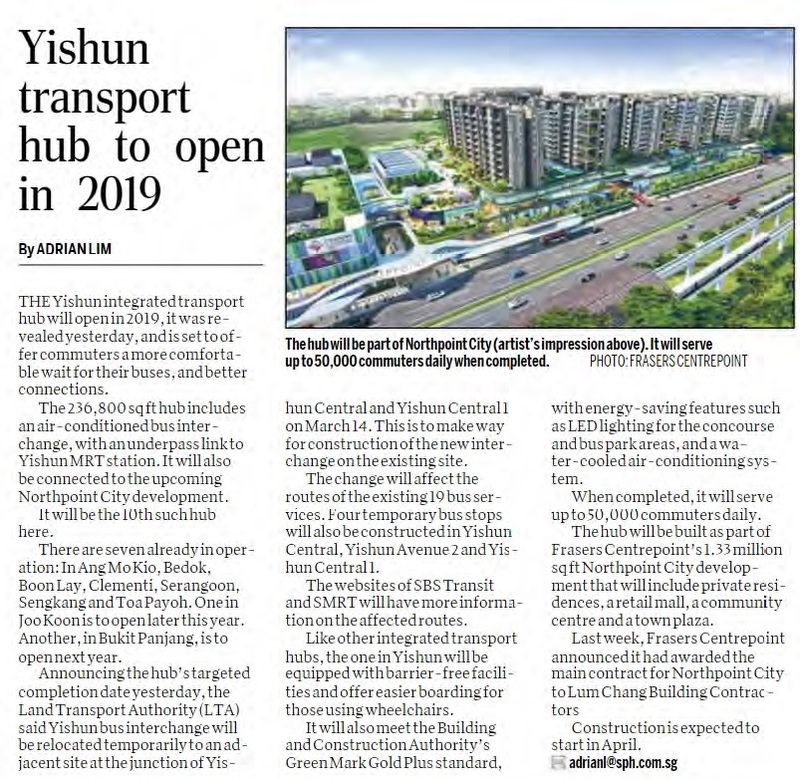 vi) Yishun integrated transport hub will open in 2019, offering commuters a more comfortable wait for their buses, and better connectivity. The hub will comprise an air-conditioned bus interchange, along with an underpass link to the Yishun MRT station and to the upcoming Northpoint City development by FraserCentrepoint. 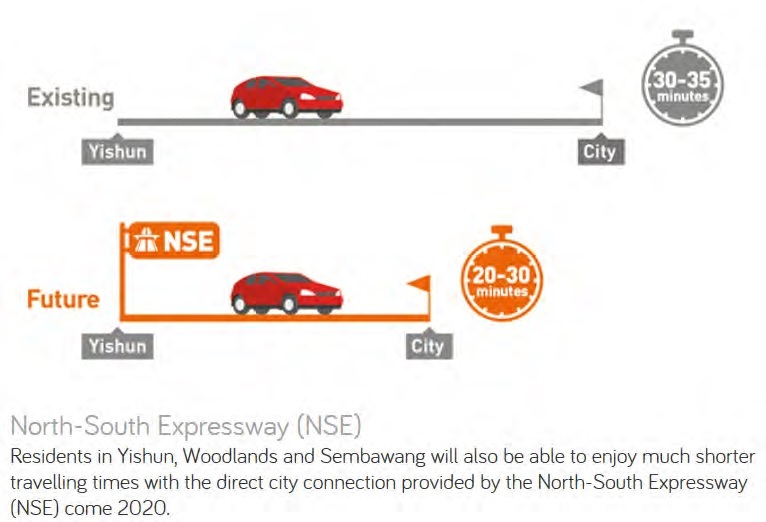 vii) Future North-South Expressway by 2020, connects Yishun, Woodlands & Sembawang closer to City. NSE well connects the expressways SLE & CTE, providing easy access to other parts of Singapore. viii) In January 2015, a new road, Yishun Avenue 8,between Yishun Avenue 6 and Yishun Avenue 1 opened to traffic, providing an alternative route for motorists travelling to Seletar West Link and Tampines Expressway (TPE). 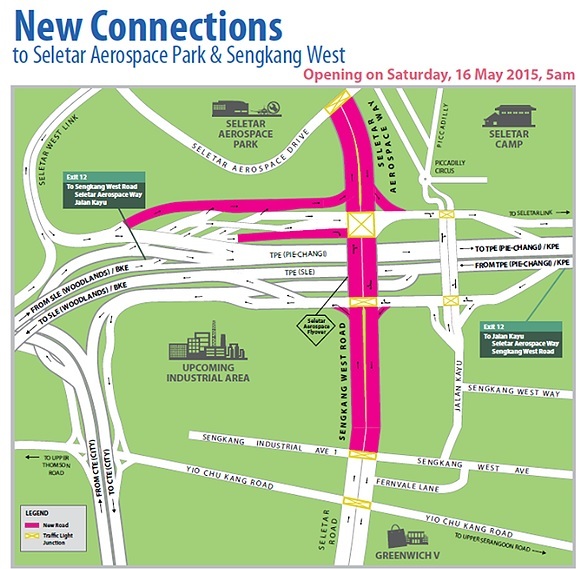 ix) Further enhanced by new road connections that opened in May 2015 between Yishun Ave 1 to Seletar Westlink/ Aerospace Way to SengKang West Road/Upcoming Industrial area, and TPE (PIE Changi/ KPE/ SLE), BKE (Woodlands)/ SLE. Interested in EC or Private Developments in Woodlands or Yishun or SengKang/ Punggol instead? Contact us by clicking here. 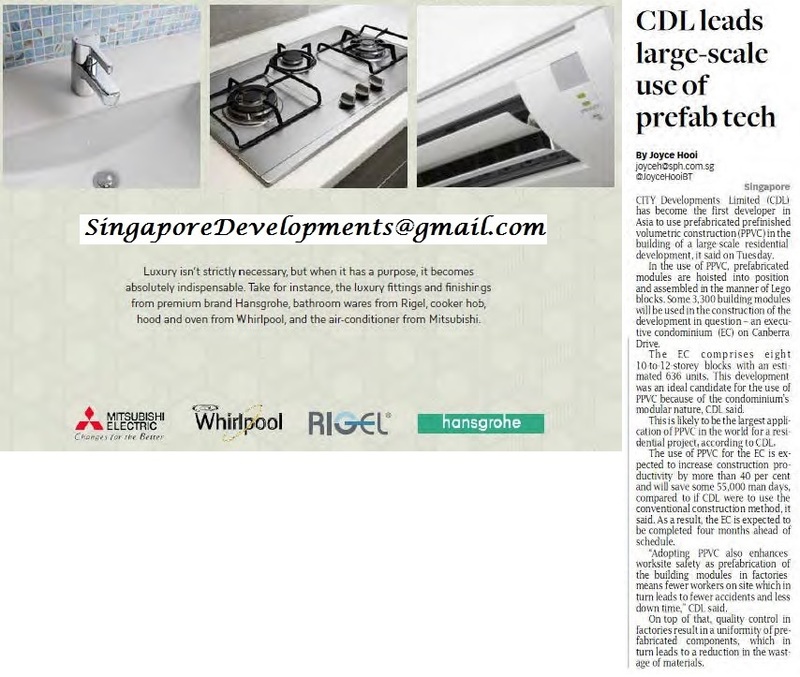 CDL has been Singapore’s property pioneer with a legacy of 5 decades & has been one with sustained growth & accomplishment. With an extensive network of more than 400 subsidiaries & associated companies under its wings, CDL has 5 companies listed on notable stock exchanges (NZ, HK, London, Philippines). The Group currently owns & manages a solid portfolio of residential & investment properties, in additions to Hotels, across Asia, Europe, Middle East, North America, and New Zealand/ Australia. CDL holds an impressive track record of having developed over 36,000 luxurious & quality homes across diverse market segments. As one of Singapore’s biggest landlords, it owns close to 72,000 square feet of floor/ lettable area of office, residential, retail, industrial & hotel space locally & globally. and that all New properties near MRT are expensive. Buy Early before prices Rise markedly near Line Completion. A) Near to the well-developed neighbourhoods of Yishun and Woodlands which provide well range of business, leisure, shopping and dining amenities as well as excellent transport connection. B) Good rentability – with upcoming industrial developments along Gambas Avenue, Woodlands Regional Centre and North Coast Wafer Fab Park nearby. C) Near Seletar Aerospace & Upcoming SengKang Industrial. D) Home prices near MRT set to Rise! E) Advanced Technology for higher Productivity = Lower Costs transferred to Buyers! F) Brownstone EC is also fitted luxuriouslywith branded fittings & furnishings fromPremium brands: HansGrohe & Rigel for bathrooms, Whirlpool hoods & hobs for kitchens, Mitsubishi air-conditioners. 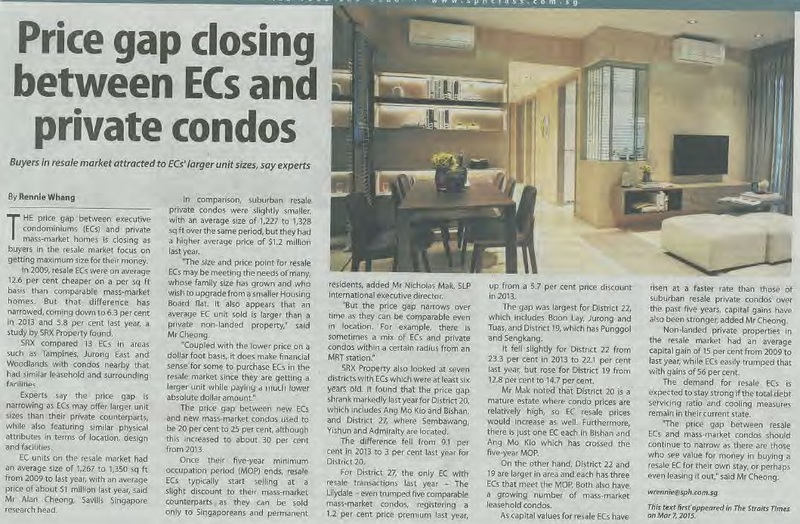 G) Prices of Resale ECs almost = Private Condo units! Why Buy New Launches Direct From Developer? DEVELOPERS ARE MOTIVATED SELLERS WITH PRICE TO SELL DURING THE VVIP PREVIEW AND MAIN LAUNCHES. THE NEW LAUNCHES TYPICALLY ALLOWS YOU TO SELECT THE BEST UNIT AT BEST POSSIBLE PRICE FROM DEVELOPERS. THE PROGRESSIVE PAYMENT ALLOW YOU TO PAY STEP UP MORTGAGES PAYMENT DURING CONSTRUCTION PERIOD. OR EVEN DEFERRED PAYMENT WITH BRIDGING LOAN SCHEMES, DO CONTACT US FOR FURTHER DETAILS. THE SELLER STAMP DUTIES OF 16%/ 12%/ 8%/ 4% FOR PROPERTIES SOLD WITHIN 1ST, 2ND, 3RD AND 4TH YEAR WILL BE REDUCE DRAMATICALLY OR ELIMINATED ONCE THE PROJECT TOP, AS THE CONSTRUCTION PERIOD IS TYPICALLY 3-4 YEARS AWAY. YOU GET TO LIVE IN THE NEW CONDOMINIUM UNIT AND YOU CAN RENOVATE OR FURNISH ACCORDING TO YOUR NEEDS AND DESIRE. THERE IS NO NEED TO PAY AGENT’S COMMISSION AS THIS IS PAID BY THE DEVELOPER. IF YOU ARE BUYING FOR INVESTMENT, THERE IS NO IMMEDIATE NEED TO LOOK FOR TENANTS. BUY NOW TO ENJOY FUTURE CAPITAL APPRECIATION OR SIMPLY FOR OWN STAY. Register your Interests to Understand more about the Benefits of owning an Executive Condo as opposed to a Private Condo or Resale HDB Flat with FREE Tickets to our Upcoming Seminars by clicking here! Book an Appointment to be treated as our VVIP by clicking below. View any of our upcoming new EC launches, Cut the Queue & get Priority Booking (balloting) & Chit-chat over Coffee on eligibility here!